My name is Matt Moore. I’m 23 years old. I live in Suffolk and play for the Woodbridge Wheeled Warriors rugby club. I have been with the team for roughly 4 years. 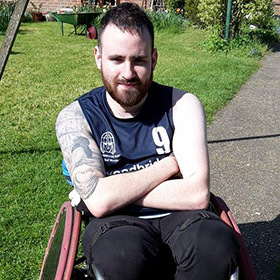 I played rugby as a child, until the age of 13 when I had a trampoline accident in 2007 which left me as a C4, C5 and C6 Tetraplegic. I initially spent 7 months in Addenbrooke’s Hospital, and was then moved to Stoke Mandeville Hospital. This is where I first found out about Wheelchair Rugby. After leaving hospital, I didn’t tend to leave the house as it took a while for me to come to terms with it all. After spending a few years stuck in a rut and not doing much, I realised that I needed to get living and that there is more to life. I found the Woodbridge Wheeled Warriors and started to train and gain confidence. Since starting playing rugby a lot has changed for me for the better. Physically, I am fitter and stronger which has helped with self-confidence. It has also allowed me to meet a lot of new friends who are in similar situations and has allowed me to start travelling. I was borrowing a chair from the club which was a little big, and I knew that if I wanted to progress in the sport, I needed a new rugby chair. This is when I approached the Matt Hampson foundation who ever so kindly helped me fund a new chair. It has made great improvements to my gameplay, speed and agility. I would like to thank the Matt Hampson Foundation for helping me get the best out of the sport and out of life.